The Western Region Audiovisual Producers Fund (WRAP) has announced that applications for the latest round of development support for feature film, television and animation projects is now opened with a new deadline of Tuesday, 30th April 2019. A development loan of up to €15,000 is available to support the development of a feature film, television drama, animation or game at any stage from treatment to pre-production. A WRAP development loan is available to teams where at least one Producer has a production company located/established in the Region (Clare, Donegal, Galway, Mayo, Roscommon, Sligo). For Feature Film/Television/Animation: a Producer(s) and Writer(s) attached. A Director(s) must be attached in the case of a documentary but is not mandatory in other genres. For Games: a Developer(s), Designer(s) and Programmer(s) attached. have secured clear access to the necessary rights in any material that is to be adapted for the screen. Please ensure that you have consulted the relevant WRAP Development Funding Guidelines (Film/Television/Animation or Games) in advance of submissions. Applicants wishing to apply for (Film/Television/Animation) are asked to complete the application form and submit along with the requirements by email to wrap@galwayfilmcentre.ie by 5pm on Tuesday 30th April 2019. Late or incomplete applications will not be accepted. A new deadline for WRAP Development Funding (Games) will be published shortly. 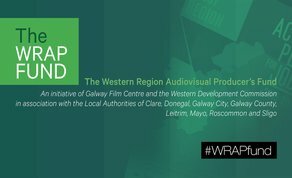 The Western Region Audiovisual Production Fund is an initiative of the Western Development Commission and the Galway Film Centre with the support of the local authorities of Clare, Donegal, Galway City, Galway County, Mayo, Roscommon, Sligo, and Údurás na Gaeltachta. WRAP is committed to a strategic investment that encourages regional production and development activity across the film, television drama, animation and gaming sectors, to support local talent, create sustainable employment, build the audio-visual infrastructure and contribute to the cultural veracity of the West of Ireland. The fund of €2,000,000 is available from 2017 – 2020.